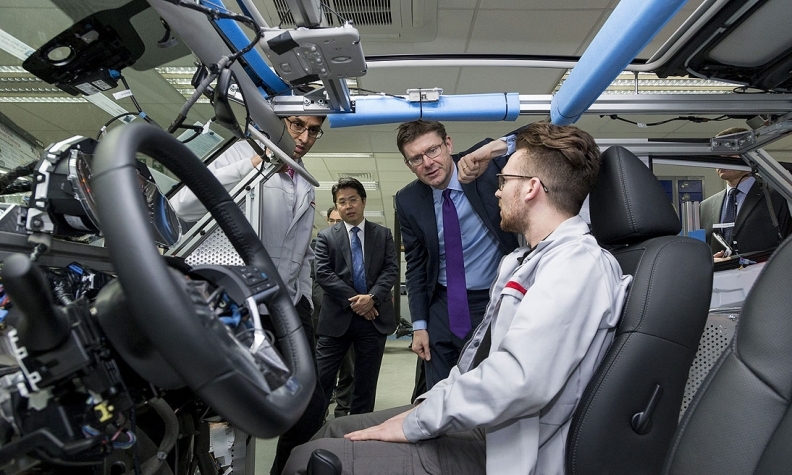 Nissan demonstrated its latest self-driving vehicle prototypes for journalists last month in London. BERLIN -- Automakers and suppliers gave widely differing timelines for the introduction of self-driving vehicles on Thursday, showing the uncertainties surrounding the technology as well as a split between cautious established players and bullish new entrants. Chief Executive Jen-Hsun Huang forecast carmakers may speed up their plans given technological advances and that fully self-driving cars could be on the road by 2025. "Because of deep learning, because of AI computing, we've really supercharged our roadmap to autonomous vehicles," he said in a keynote speech to the Bosch Connected World conference in Berlin. Nvidia has applied its market-leading expertise in high-end computer graphics to the intense visualization and simulation needs of autonomous cars, and has been working on artificial intelligence -- teaching computers to learn to write their own software code -- for a decade. On the way to fully self-driving cars, levels of autonomy have been defined, with most cars on the road today at level two and Tesla ready to switch from level four to five -- full autonomy -- as soon as it is permitted to do so. The head of autonomous driving at BMW, Elmar Frickenstein, told the conference the luxury carmaker was on its way to deliver a level three autonomous car in 2021, but could produce level four or five autonomous cars in the same year. "We believe we have the chance to make level three, level four and level five doable," Frickenstein said. He told Reuters the decision on which levels to release would depend in part on the market, and that cars with more autonomy might first be produced in small batches for single fleets.